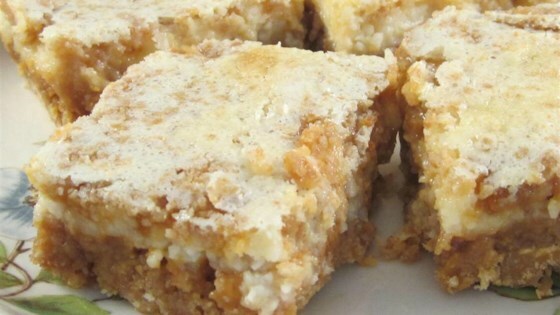 "Even if you aren't a fan of cheesecake, give these a try. Everyone who tastes them loves them." Heat butterscotch chips and butter together in a saucepan, stirring frequently, over low heat until melted, about 5 minutes. Remove saucepan from heat and stir graham cracker crumbs into butterscotch mixture. Measure 2/3 cup graham cracker-butterscotch mixture and set aside; press remaining mixture into the prepared baking dish to form a crust. Beat cream cheese in a bowl using an electric mixer until light and fluffy. Add sweetened condensed milk, egg, and vanilla extract; mix well. Pour cream cheese mixture over crust. Sprinkle reserved graham cracker-butterscotch mixture over cream cheese mixture layer. Bake in the preheated oven until a knife inserted in the center comes out clean, 25 to 30 minutes. It doesn't get any easier or tastier than this. We thought they were yummy. I am certainly in the minority because I did not care for these. The crust was too hard and the bars were too thin. Don't think I would make these again. Delicious and easy. Hardest part was cutting through the hard crust and getting them out of the pan without the bottoms cracking. just as the recipe called for. I made as written. Turned out awesome! Many yummy complements!